Getting ready to start building my strawberry tower. I am going to use ideas from two different systems that I found on-line. 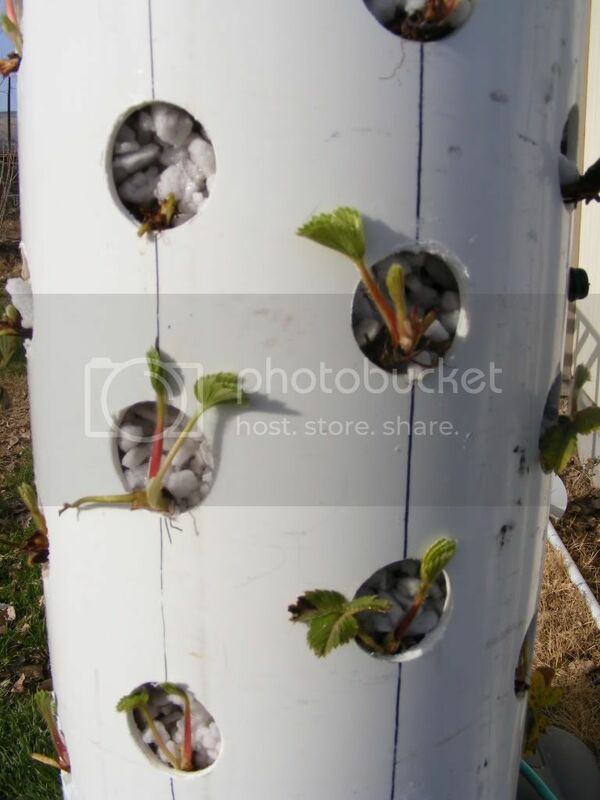 It will be a recirculating drip system with 100 plants in an 8" verticle pvc pipe and will be part of a demonstration exhibt at our local fair. It's suppose to snow tonight so I hope I can finish the system after work and plant tomorrow. I will have to heat the nutes and cover them at night for a week or so, but they need to get planted as they are already starting to green up and grow. Anyway, just wanted to share whats going on in my part of the world. Cool! Post some pictures once you get it all together. It's up and running.... in my kitchen Will try to post some picts soon. I'm doing this also and I'm having trouble finding a pump that will lift my water that high and a sprinkler that will not clog up. If you have gotten past this please let me know. I have gone back to floating them. I looked for a pump with a 10 foot head. I found a 9.5 max head from Eco plus called a Eco 1056. I have noticed that most pumps over 1100gph have enough head to lift that far. I don't use a sprayer, I just looped a piece of 1/2" tubing and poked holes for it to spray out and connected it with a 1/2" T fitting. About 10 holes that went from side to side so a total of 20 holes I kept the tubing about 2"s from the edge of the pipe and that allows for pretty even coverage from the center out. It just drips out and down and works well. Looks really cool! What do you have collecting the water at the bottom? Any way we could get some updated pics? I would consider blacking out your reservoir or you are going to e fighting algae problems. Newbie to gardening. Please pardon the ignorance. It's just temporary, I plan on burying a 55 gal drum next weekend but thanks for the helpful info. I purchased some dark green paint to paint it but there has only been a couple of days that it hasn't rained. I also plan on wrapping the tubing in some foam pipe insulation. 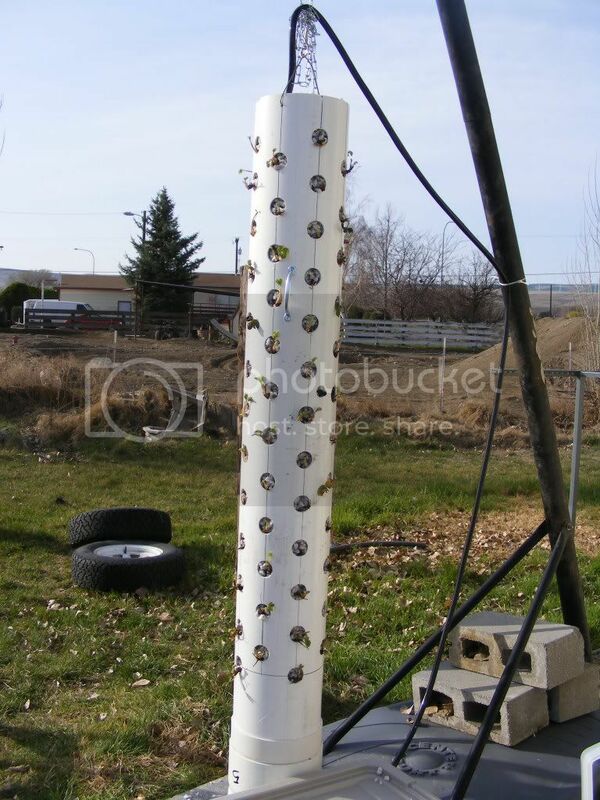 There will eventually be 4 tubes there, but I've been sick and only built the one to get the strawberries started. Good deal. It is an interesting contraption for sure. I'm executed to see it covered in vines. Are your strawberry plants in starter cubes then tucked into the gravel or are they just directly in the gravel? And did you just use regular gravel? The only problem I see with the 55 gal drum is that the tube is going to have to be over the water level other wise it will back up the tube and you'll have your water everywhere. 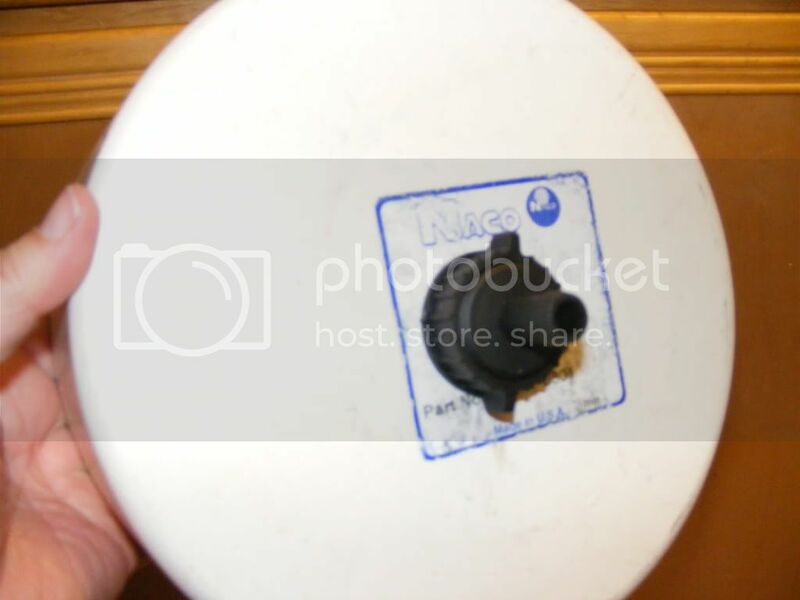 It would probable work good if you dug a hole for the drum but that's a lot of work. 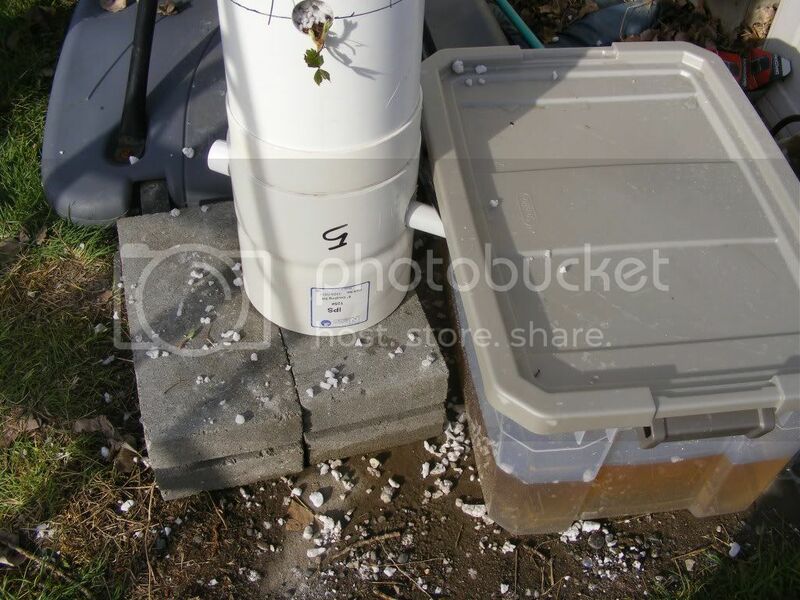 How do you plan to drain the water into the 55 gallon drum? 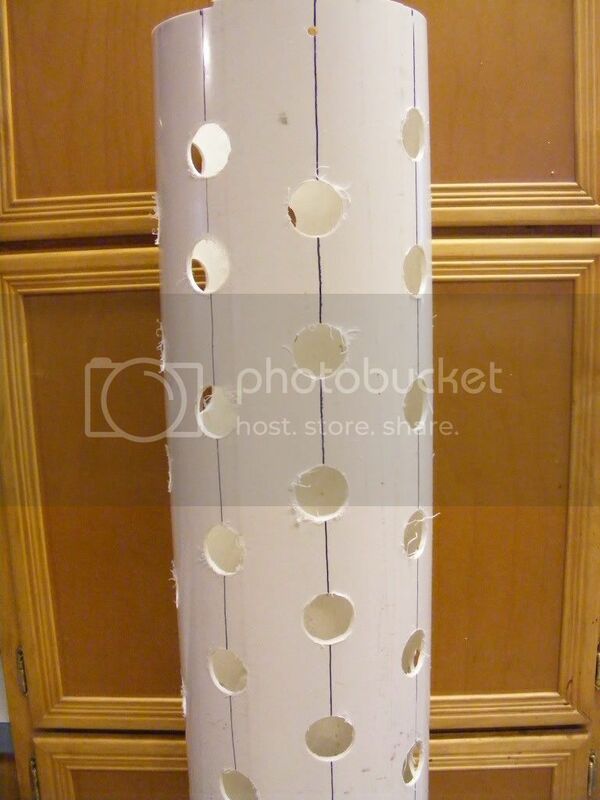 If the drain comes out into the water it will all flow out the holes in the pipe. So how do ou plan on getting the pipe to come out above the water level in the drum. I have to bury the drum because it gets really hot here in the summer. It's really the only way to keep it cool enough.